In the past few weeks thousands of young first year college students gathered for convocations across the US — the beginning of a new academic year. A convocation is a calling forth to assembly by summons. It’s a long standing tradition inherited from the culture we fought against, Great Britain. In Hymn, ‘O Day of Rest, Wordsworth writes, “To holy convocations The silver trumpet calls.” This past week students marched quietly and obediently into sanctuaries of learning because they’ve heard the call from higher education: come forth to your future — here is your future. In the Church of England, a convocation is a provincial synod or assembly of the clergy, constituted by statue and called together to deliberate on ecclesiastical matters. Despite faculty regalia (very Harry Potter — no wonder Quidditch is played on some of our campuses! ), and the convocation usually taking form in hallowed ground in colleges and universities, in the secular world, first years are called forth to deliberate matters of conscious, moral matters that can be questioned in the disciplines. First years are called forth by the faculty, the representatives of knowledge, the bearers, we like to think, of wisdom; we call forth young minds eager to confront the ideas that have created our civilization, to learn. But to what exactly are we calling first year college students? Two provocative New Yorker covers show the confusing world our knowledge making has created for our first years. 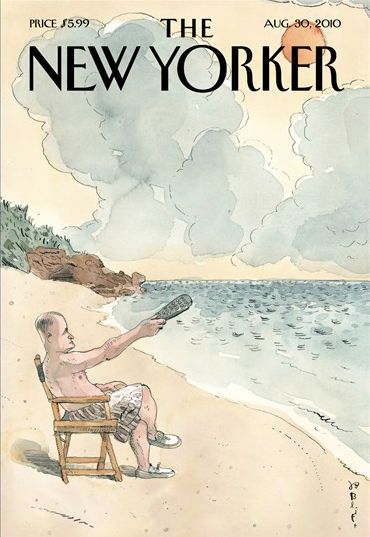 We are calling our first years to Barry Blitt’s August 30 cover, “Pause,” and Peter de Sève’s “Beasts of Burden,” September 13. [p]In Blitt we find a relaxed middle aged man, his slight paunch of satisfaction and complacency, staring at a vast ocean and murky sky, a world that’s wide and foreboding, aiming a remote control to pause it — or to change it. 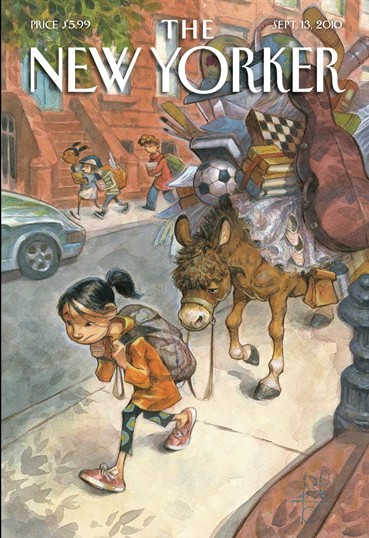 Peter de Sève gives us a city street, in the foreground a child bent over from the heavy backpack, pulling a donkey that is likewise burdened by all the belongings of her master; across the street, kids carry books as they hurry to school. Access and social mobility separated by a street — Main Street — where we find promise and hope on one side, the hopeless “beasts of burden” on the other. In Blitt’s “Pause,” man is tragically convinced that he can “pause” the rate of change — be it climate change, political change, a change in how we perceive justice. In this cover cartoon, Blitt’s middle aged man still sees himself as the center of the world, now holding forth with a technology he falsely believes can save us. Our students have been raised with this conviction — technology can solve everything. De Séve shows us how blind we are, unable to see suffering at the hands of a vituperative, vertical socioeconomic system that relegates positions we can’t get out of, so we justify these with even more ideals — they must be lazy, if they only worked as hard as we do. What can I do to change this? our young minds wonder, succumbing to the wild and negative distributions of power. In both cartoons we see a society that scorns knowledge. “To know — that is, to have knowledge — is to instinctively understand the relationship between what you know and what you do,” says Saul. In Blitt and de Sève, knowledge is totally absent — gone, lost. We, the faculty, have lost our wisdom and we’re about to impart this sense of loss to our students. So while our young minds struggle to understand just how perverse the world we’ve created really is, they also must confront the notion that colleges and universities have been constructing a decorous world of illusion that cannot go on, if for no other reason than how we’ve been going to school and what we have been turning out as our future leaders have given us the world we now inhabit. We can’t “pause” this world — and in it, there is no Main Street, we are all “beasts of burdens” separated only by degrees. Welcome to your first year! This entry was posted in america's apartheid system of education, Citizenship, Class, cultural studies, education, philosophy, politics, Race and Ethnicity, Religion, Socio-Economic insecurity, technology and education, the University by hector. Bookmark the permalink.